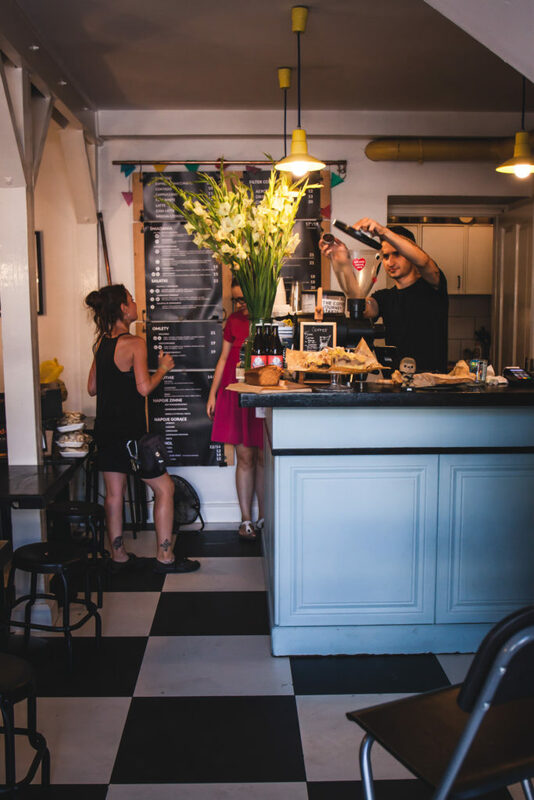 Where to go for a coffee in Warsaw? 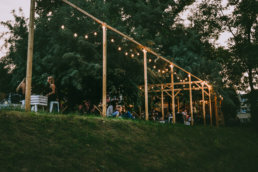 Today’s blog post is another compilation of our favourite spots in Warsaw. 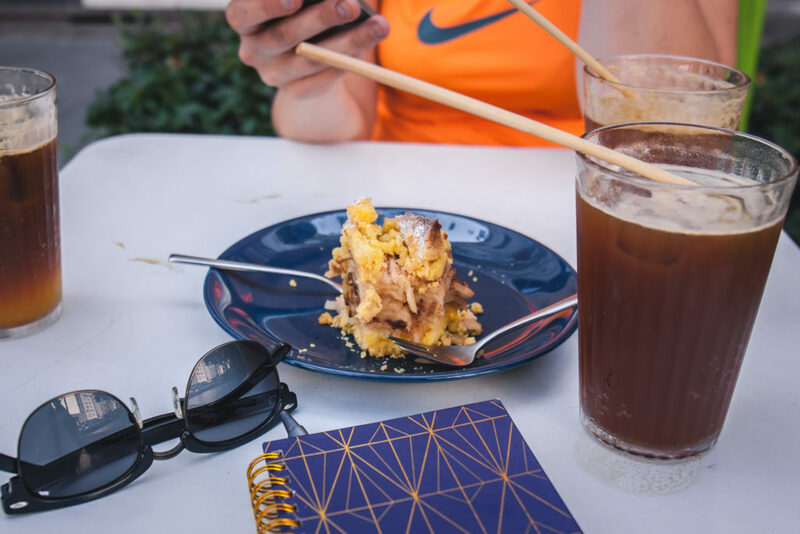 This time I focused on cafes, where we spend lots of time, but never have enough to say to devote an entire post to such a visit. 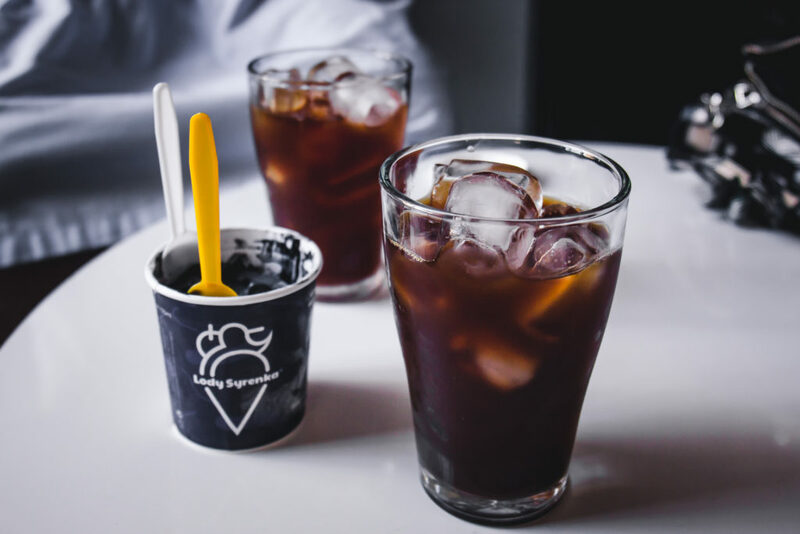 In today’s post you will find a mixture of everything: alternative methods of making coffee, a few instagrammable places, a few pieces of cakes (because coffee without dessert is not the same!) and a nice, cozy atmosphere. 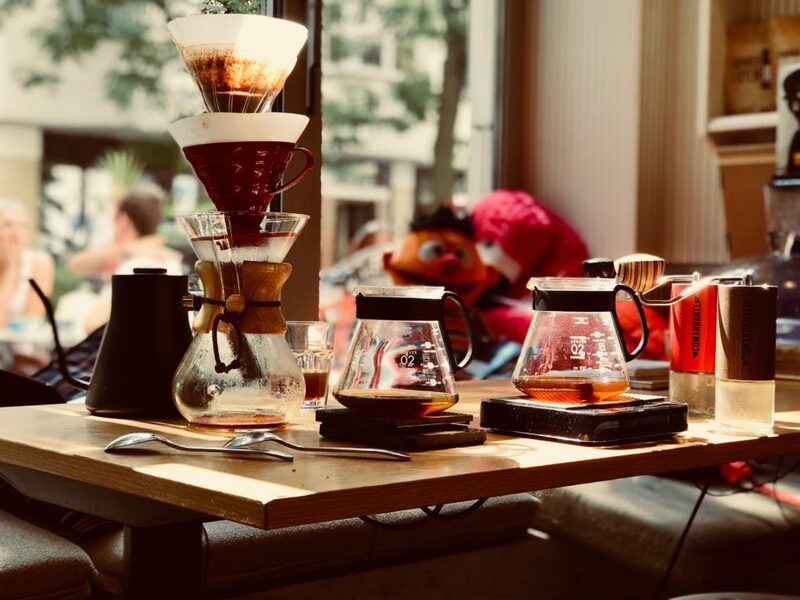 I do not take it upon myself to rate the cafes, to tell you which are the best, and where baristas might not be experts when it comes to brewing coffee. I’m not an expert myself. I simply enjoyed spending time in the spots I’m describing for you today. 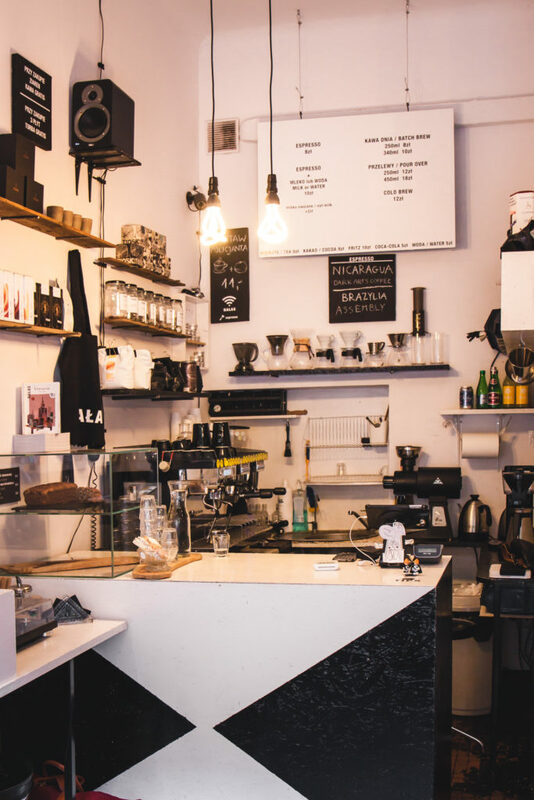 If you need more detailed information, more recommendations form a specialist’s point of view be sure to check out the newly realesed guide to coffee spots in a book form – “Coffee Spots Polska”. 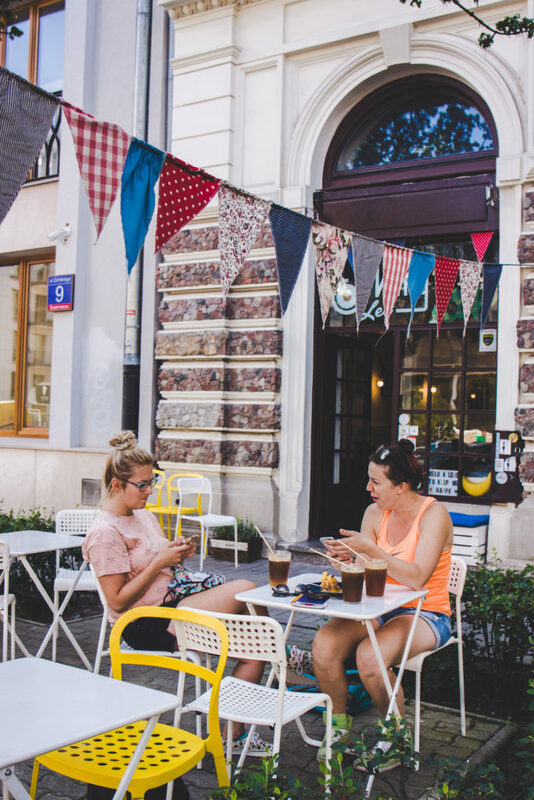 It’s a useful compendium, and they write not only about cafes in Warsaw but all over Poland.But before you buy the book, here are my recommendations for places where you can spend a nice afternoon drinking coffee. I came to Krem completely by accident when I was looking for a place where I could sit down with a computer for an hour. I already knew this place existed, but somehow It was never on my way. In my mind, Krem existed as a nice picture, which I saved on Instagram as an interior design inspiration. And in fact, the interior is very nice. There is also more space than I thought, there is one more room inside, which I did not visit with the camera, because it was as dark as a tomb. The coffee here is great, very delicate in taste. As I like it. There’s also good service and good music coming from the speakers. When I entered it was almost empty so it was also really quiet. Later on, as the lunch time started, more people came to eat and it was a bit more noisy. So if you want to work, be sure to come early. The menu also looks promising. Maybe except for desserts. 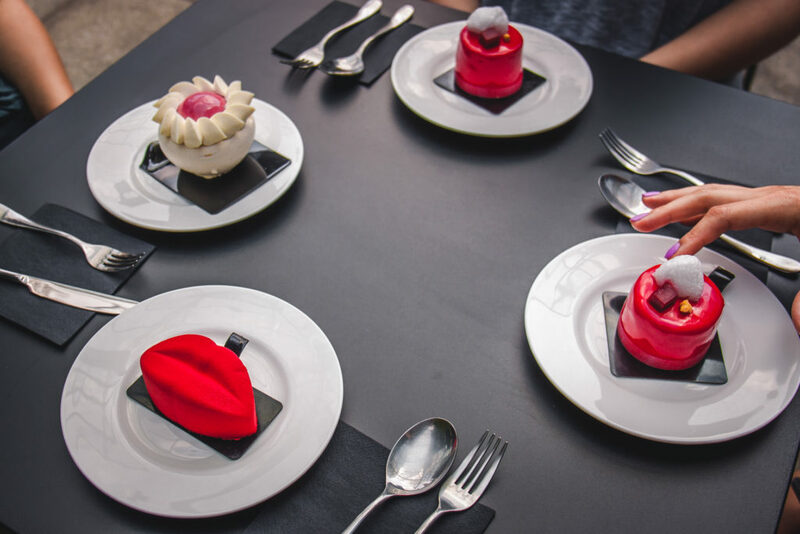 I sat down with a plan to order a dessert, but nothing really interested me. However, I made a mental note to come for breakfast next time and order Crocque Madame. EDIT: When I uploaded a photo from Krem to Instagram, I got a few messages along the lines of “how did you like this crappy place?!”. It seems that lots of people are not enthusiastic about this place. 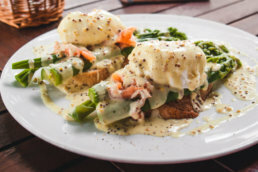 General criticism is primarily about the crowds on the weekends during breakfast time and the necessity to stand in queues. Apparently, the sandwiches are also average at most, although I’ve heard about every single place I ever visited that it’s “nothing extraordinary”, so I learned not to make my own opinion. I did not experience any problems, because I only came for coffee in a middle of the day on Tuesday. Just in case I warn you that it might be crowded on any other occasion. That’s one of the reasons why I enjoy my freelance job as much – weekend consumer pains do not concern me. 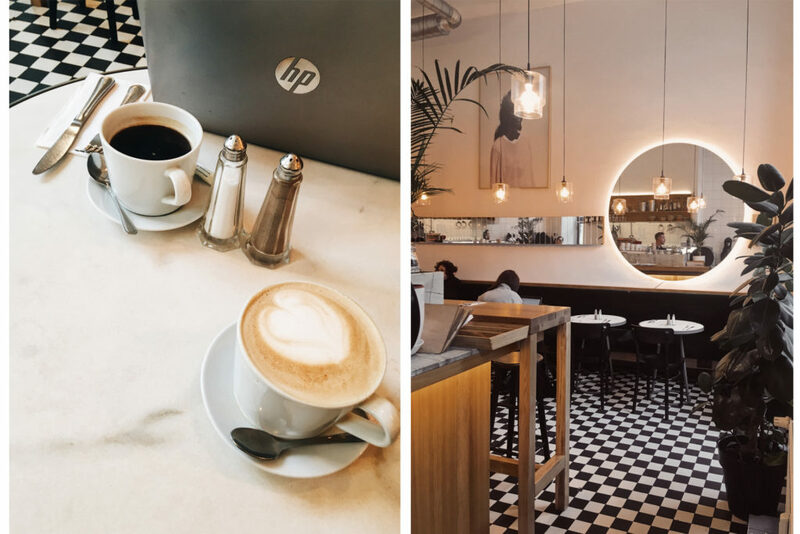 When I visited Hałas for the first time, they only had one place, a tiny cafe at Jagiellońska street, which, in my opinion, is one of the coolest cafes in Praga district. Now they have opened the second spot in Saska Kępa, which I’m yet to visit. What convinced me to visit them in the first place were vinyls. 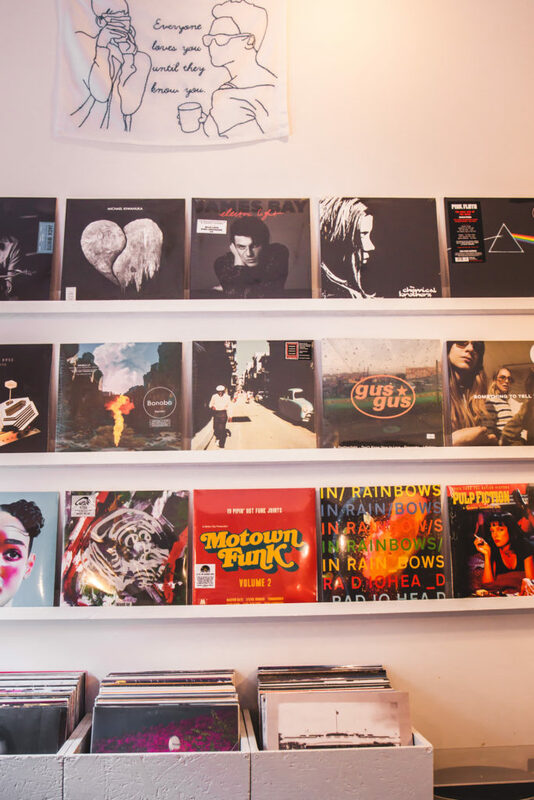 In Hałas you can not only have a cup of delicious coffee, eat cake, buy coffee for your home, but you can also buy vinyls. I love buying vinyls and don’t even want to think about how much I’ve already spent on them. And the wall filled with colourful album artwork creates a great atmosphere in Hałas. And most importantly, in Hałas the selection of coffee is substantial. It is one of those places where I feel a bit stupid when I want to order a simple cappuccino. 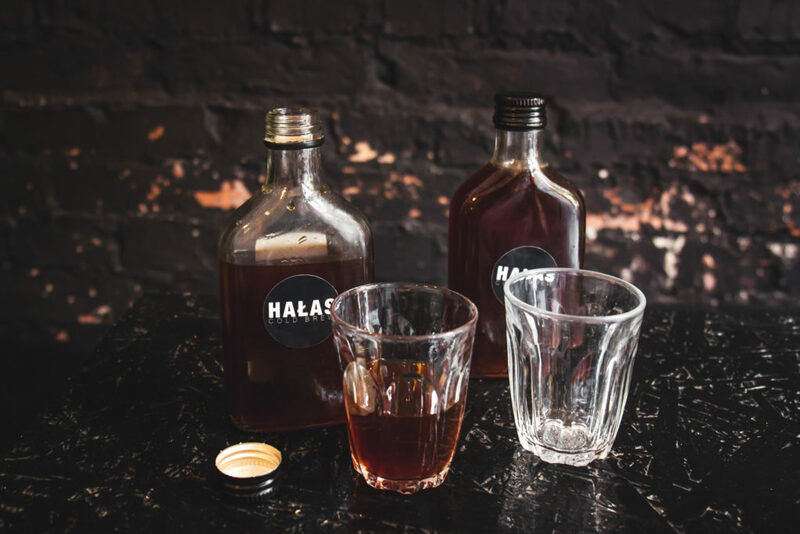 Drips, areopresses and other alternative methods of brewing coffee reign in Hałas. 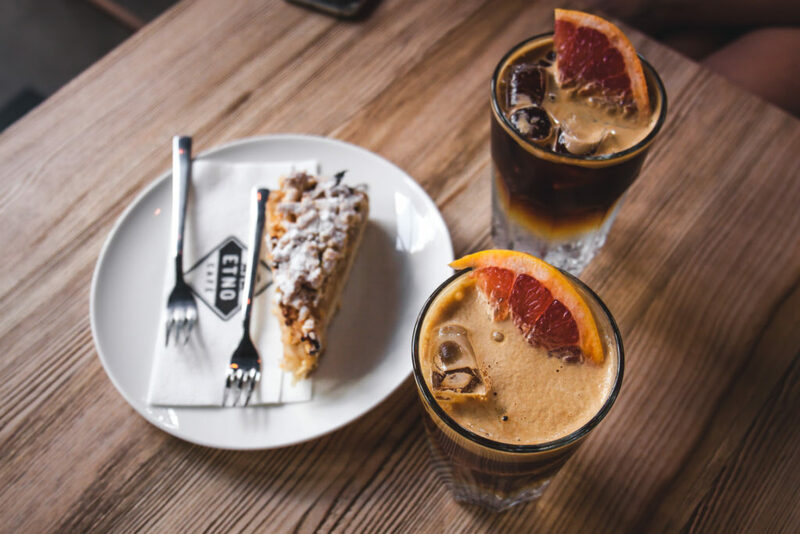 During my last visit I decided to go for one of my absolute favourites, a cold brew, which in Hałas is sold in handy bottles that you can take with you on the road. Delish! Cophi is a place that we have a special fondness for. First of all, because here you can buy sandwiches and cakes made by our own Maria a.k.a. Magic Cake. In addition, they have a really delicious coffee here, which I have been buying to make at home for over a year. I’ve even bought a kilogram as a Christmas gift for my parents last year. In fact, I do not drink any other coffee at home, except for their “lion”. If you are a fan of tea, then you must also try their blend of Mango Tango. You can buy it on their website, where you can also find all the necessary equipment to brew coffee at home. The main location of Cophi is on Hoża street and it’s tiny, but very cozy. In addition, they are seasonally selling their goods at various spots in Warsaw (for example in Żeromski Park in the summer or at Łazarski University, they even had a stand and at Nocny Market (which is closed forever I guess, sad, sad, times!) where they served delicious mini donuts. If you meet the owner, Uri, be sure to say ‘hi’ to him. He’s a great guy with lots of knowledge about coffee brewing. We learned a lot during his workshop about alternative methods of brewing coffee, in which we had the opportunity to participate at Grunt i Woda. P.S. 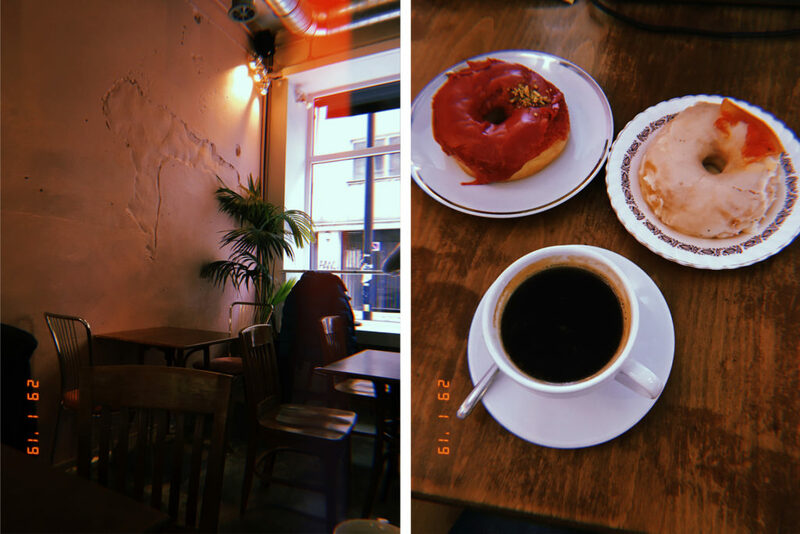 Photos taken by Łukasz, our “coffee guide” who recommended us all the best coffee spots when we were traveling around Brno, Vienna and Budapest! MOD is a multi-tasking place. 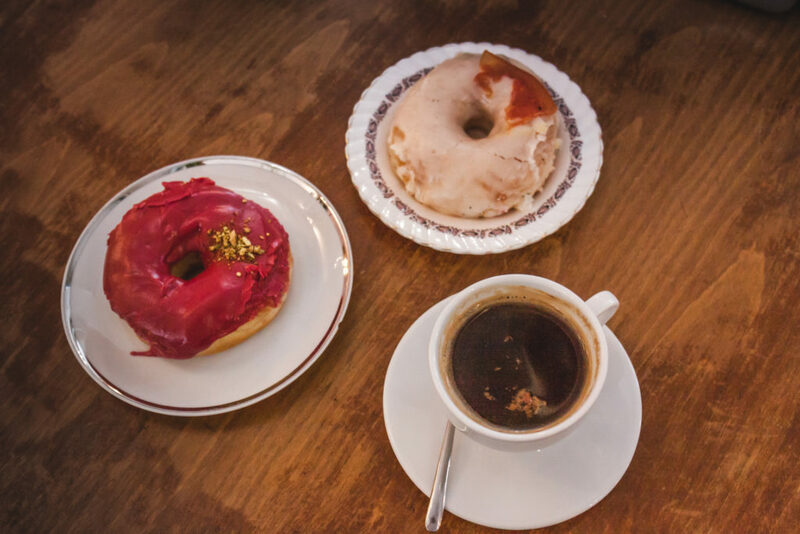 In the morning, you can drink a cup of coffee and eat a delicious donut with crazy icing available in dozens of flavours. In the afternoon, drop by for a lunch menu, and in the evening come for a feast at a “full-fledged” restaurant. When I think of MOD I think of really good ramen at first, but I also had their colorful donuts on my ‘must-try’ list for a long time. 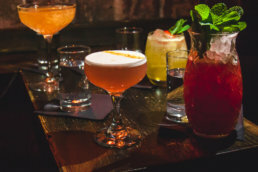 Once I tried them I knew straight away that I’ll be coming back for them regularly. Last time I tried pink hibiscus version as well as a sour grapefruit one. Both delicious and, what is important to me, not too sweet. You can also buy them to take away. 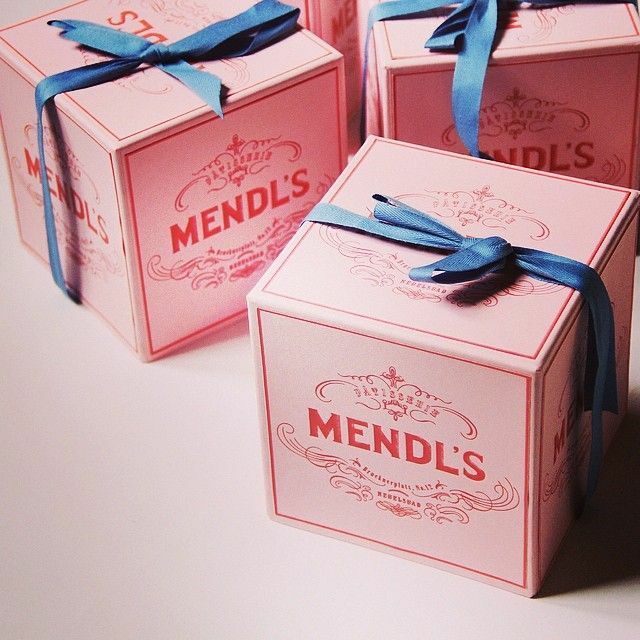 They’re sold in charming pink boxes like the ones from the Mendl’s sweetshop from Wes Anderson’s “Budapest Hotel” movie. MOD is located on Oleandrów street, one of the coolest streets in Warsaw. In fact, you can spend the whole day here, moving from one place to another. 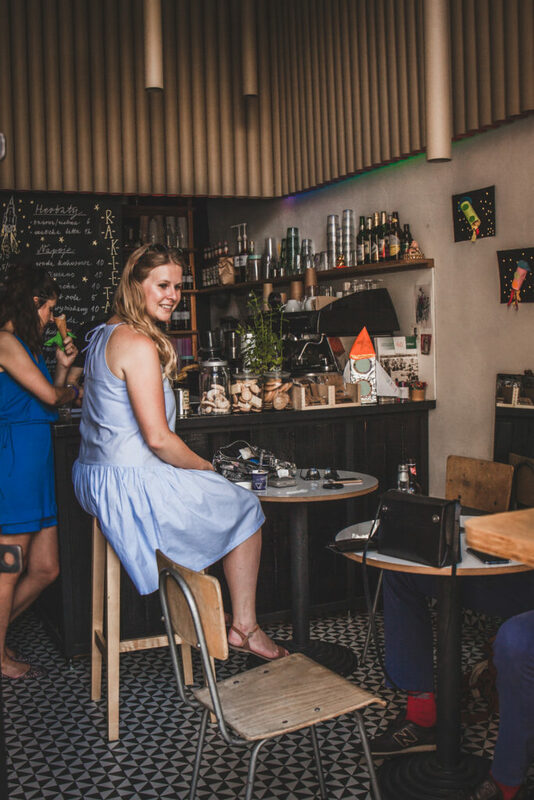 You can do vintage shopping here at Bazar Miejski, buy skincare products in the fancy O Jeju store, snack on tapas in a steampunk pub Bardziej, drink a beer from Inne Beczki, and go for a dessert, dinner, coffee and a second dessert (let’s be real here!) to MOD. The interior of MOD is also very cool. It reminds me of Berlin, mainly due to the “industrial” wall that has been stripped of plaster, which is apparently now called wabi-sabi. I created such a “work of art” myself, in my living room. At first I thought it’s a disaster and I’m simply notnot the queen of DIY repairs that I’d like to be, but Berlin (and MOD) convinced me that I am a trendsetter, not a loser. A vegan and gluten-free place run by the fans of Rolling Stones. 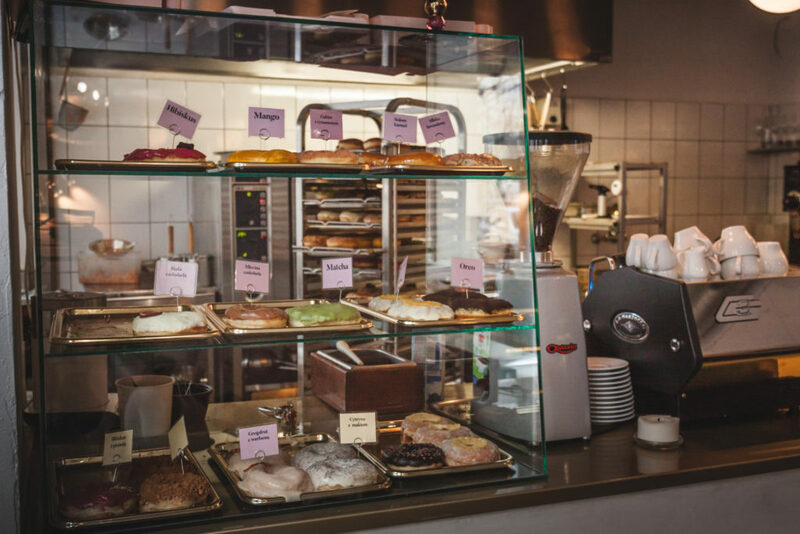 In here you will find not only coffee and cakes, but also breakfast and dinner options. Nancy Lee is a very cool place to spend hours in, working, reading a book or simply hybernating with a cup of coffee in hand. 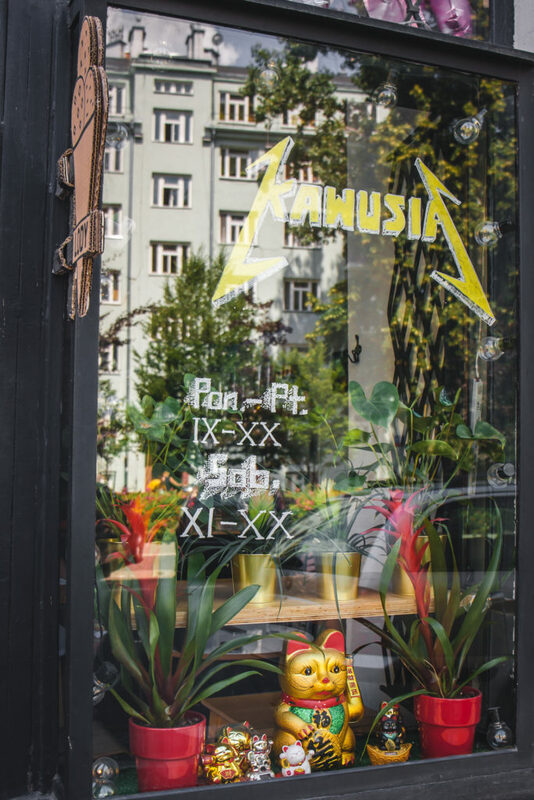 Two floors on a quiet Górskiego street, cozy interior and nice service with passion. What more can you ask for? In the summer they have an outside seating area as well. I came here by accident, when I decided to check out what is happening in the premises where my favourite cafe from student times used to be. I used to spend hours in My’o’My, as it was called before, almost every day, studying, reading books, waiting for next class to start. Nancy Lee is a worthy successor, so I will definitely be coming back here. Even though I don’t need to kill time in between classes anymore. At Nancy Lee, I can definitely recommend you my beloved tonic espresso. Here you will get a decent portion in a big glass. Perfect refreshment for a hot day (yes, I know that as I am writing this now, in a cold January morning, and it won’t necessarily encourage you to visit the place). The apple pie with corn flour was good as well. The best part was that it was not too sweet and the portion was enough to share with another person. Maybe it was just a bit too dry. Let’s move on to the world of tea, for a change. Although you can order coffee at Odette Tea Room as well. There’s no shame in that. I asked 😉 But most of all it is worth coming here for beautiful cakes available in all patterns and colours, that look like small works of art. And what surprised me the most is their taste. Despite the fact that they look like plastic sculptures, they absolutely do not taste of plastic. They are not artificial or too sweet. And after a visit to Warszawski Lukier, I already learned to not take the taste for granted. Sometimes it comes secondary to the looks. Unfortunately. But that’s not the case at Odette! 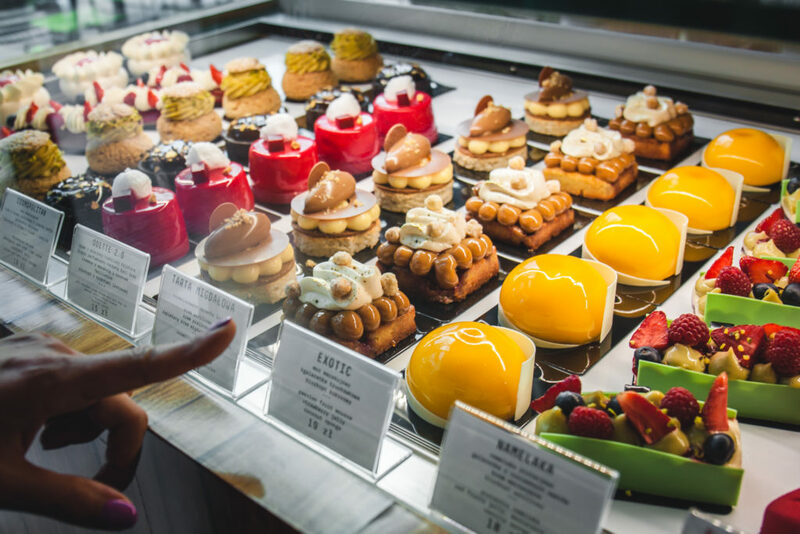 I do not know if it’s not a gastronomic faux pas, but if I’m to be honest, I enjoyed the cakes at Odetteway more than the ones sold in Deseo. 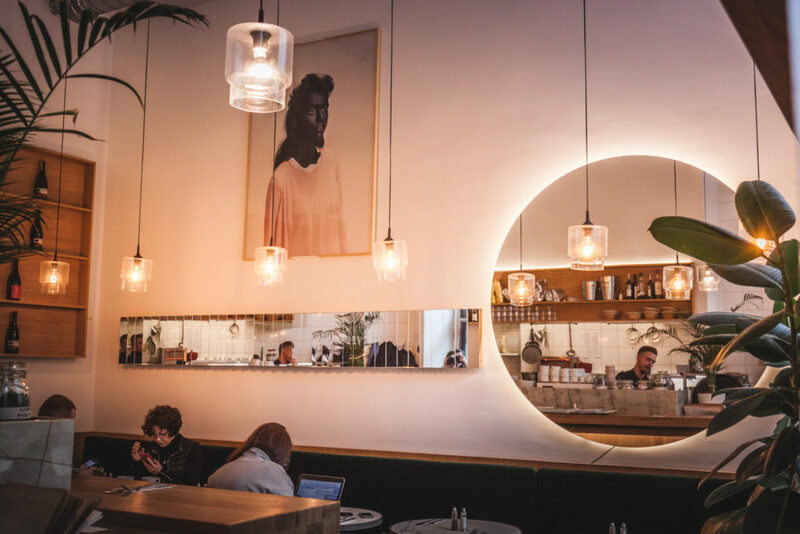 Plus it’s worth checking out Odette for the interior itself. 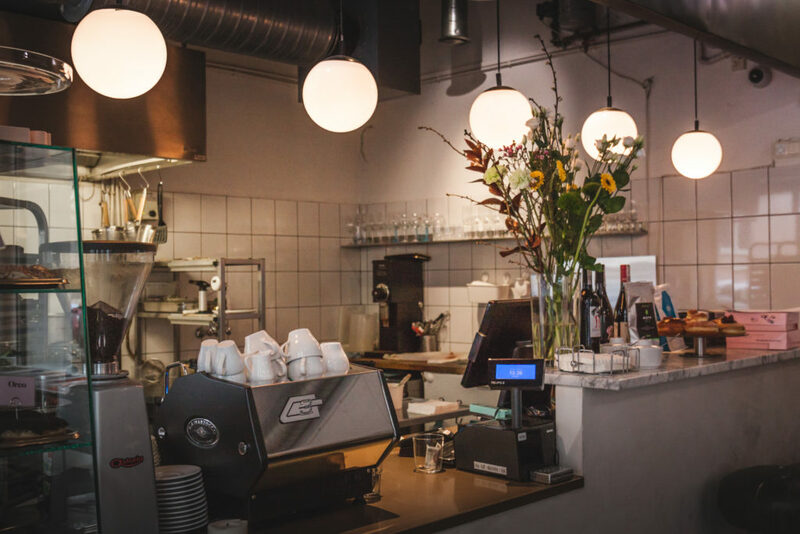 There are two Odette cafes in Warsaw. Both of them are a paradise for instagrammers. 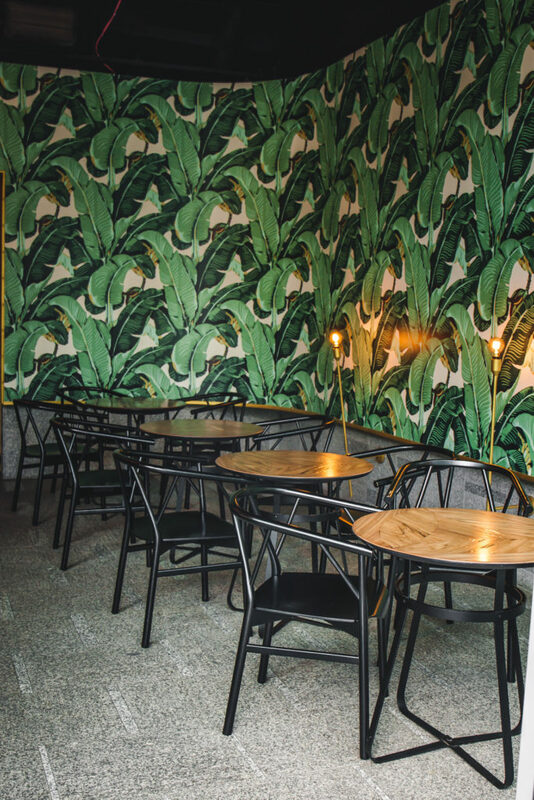 In the “original” cafe on Górskiego street you will find soft velvet, minimalist design and Pantone 2016 colours. 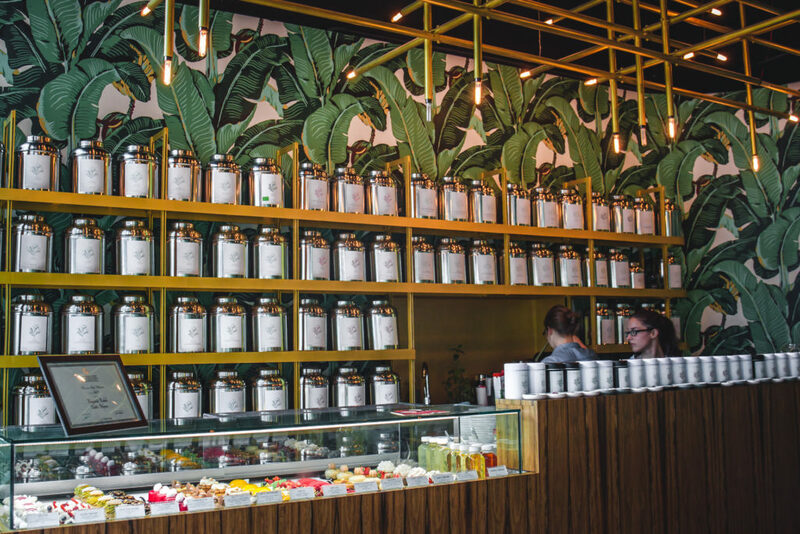 In Odette Tea Room, the ‘younger sister’ located in the Cosmopolitan building on Twarda street, you will be greeted by ubiquitous banana leaves. It certainly leaves an impression! For me, however, the best design feature about both spots are the industrial lamps. I immediately saved the photos of them to my ‘home inspiration’ folder. 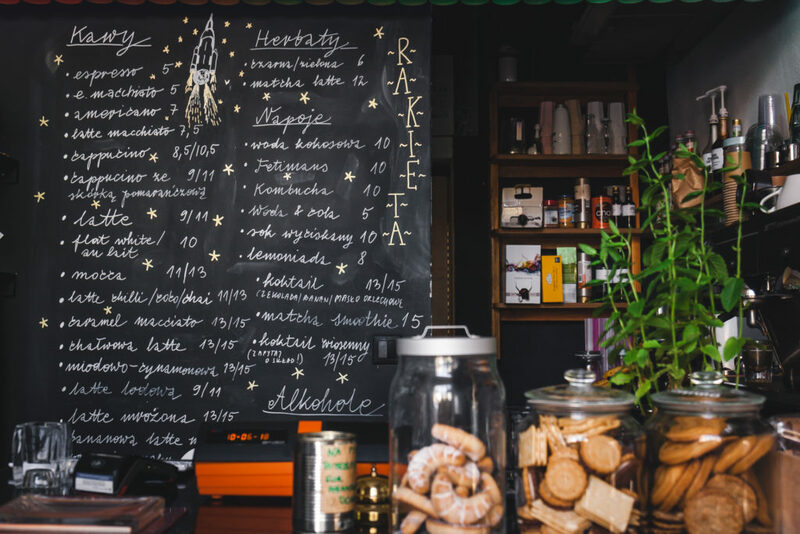 The last place I’m going to mention today is a tiny coffee spot in Powiśle district, called Rakieta Cafe. 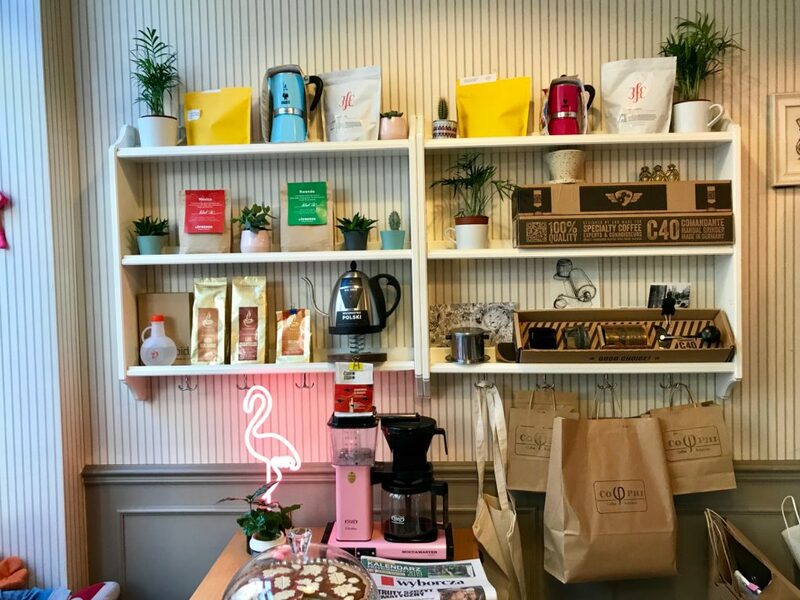 The place located on Solec street is lovely, service is great, so is the atmosphere and coffee is cheap which makes for a perfect cafe that you want to keep coming back to. Although there’s a creepy golden Chinese cat waiting for you on the windowsill (I’m always freaked out by those little buggers, who are they waving at?! Why don’t they have emotions?! Do they have a soul?! lol, jk), there is a pleasant, cozy atmosphere inside. It’s intimate, as there are only a few seats. Espresso costs 5 zlotys (a bit over 1 euro), which is as much as it should. And on a hot day, you can order coconut icecream that are black as a volcano, delicious and additionally vegan. I’m not on a frequent visitor in Powiśle anymore (I used to live there for 5 years and it’s still my favourite district in Warsaw! ), but I had such a good experience at Rakieta that when going in the area, I will surely drop by for a quick coffee. And I recommend you to do the same!